NetBet Casino are running a Spring Supreme Tournament whereby they are giving away a total of £30,000 in cash – find out how to win your share below. You need to firstly head to the ‘Promotions’ section at NetBet Casino – there’s a button at the button of any page. Then you need to opt in. 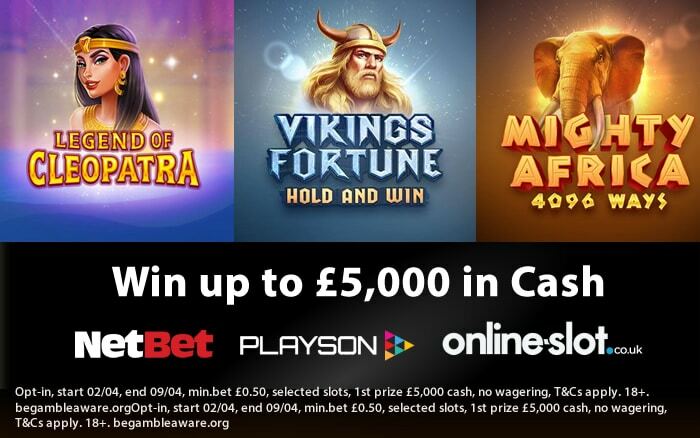 Then, you need to play 50 spins on the eligible slots from Playson at 50p a spin or more to enter the tournament. You will receive 10 points for each total stake multiple won in the slots – i.e. you will get 100 points if you stake £1 and win £10. By the way, the tournament runs until 23:59pm UK time on Tuesday the 9th of April (2019). What slots can I play? All eligible slots are powered by Playson and include Book of Gold: Double Chance, Wild Warriors, Seven & Fruits: 20 Lines, Fruits & Clovers: 20 Lines, Sevens & Fruits, Super Burning Wins, Fruits & Jokers: 20 Lines, Mighty Africa: 4096 Ways, Legend of Cleopatra, Rise of Egypt, Burning Wins, Crystal Land and Imperial Fruits: 5 Lines. My pick would be their latest release – Vikings Fortune: Hold and Win. Based on Norse mythology, this 5 reel, 25 payline slot comes with a Free Spins feature where you can win up to 16 free spins – there are colossal symbols that are up to 3×3 in size for bigger wins. The Bonus Game feature sees you get streak respins to win cash prizes – there’s also 3 jackpots to be won here with the Grand Jackpot worth 1,000 times your stake.